The carbon cycle is the process in which carbon atoms are recycled over and over again on Earth. Carbon recycling takes place within Earth's biosphere and between living things and the nonliving environment. 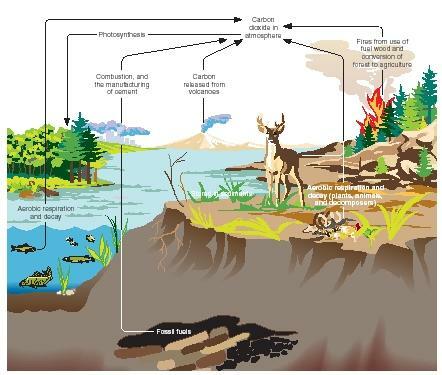 Since a continual supply of carbon is essential for all living organisms, the carbon cycle is the name given to the different processes that move carbon from one to another. The complete cycle is made up of "sources" that put carbon back into the environment and "sinks" that absorb and store carbon. Earth's biosphere can be thought of as a sealed container into which nothing new is ever added except the energy from the Sun. Since new matter can never be created, it is essential that living things be able to reuse the existing matter again and again. For the world to work as it does, everything has to be constantly recycled. The carbon cycle is just one of several recycling processes, but it may be the most important process since carbon is known to be a basic building block of life. As the foundation atop which a huge family of chemical substances called organic substances are formed, carbon is the basis of carbohydrates, proteins, lipids, and nucleic acids—all of which form the basis of life on Earth. Since all living things contain the element carbon, it is one of the most abundant elements on Earth. The total amount of carbon on Earth, whether we are able to measure it accurately or not, always remains the same, although the carbon regularly changes its form. A particular carbon atom located in someone's eyelash may have at one time been part of some now-extinct species, like a dinosaur. Since the dinosaur died and decomposed millions of years ago, its carbon atoms have seen many forms before ending up as part of a human being. It may have been part of several plants and trees, free-floating in the air as carbon dioxide, locked away in the shell of a sea creature and then buried at the ocean bottom, or even part of a volcanic eruption. Carbon is found in great quantities in Earth's crust, its surface waters, the atmosphere, and the mass of green plants. It is also found in many different chemical combinations, including carbon dioxide (CO 2 ) and calcium carbonate (CaCO 3 ), as well as in a huge variety of organic compounds such as hydrocarbons (like coal, petroleum, and natural gas). Respiration: The process in which oxygen is used to break down organic compounds into carbon dioxide and water. If a diagram were drawn showing the different processes that move carbon from one form to another, its main processes would be photosynthesis, respiration, decomposition, natural weathering of rocks, and the combustion of fossil fuels. make their own food, they must get their carbon either directly by eating plants or indirectly by eating animals that have eaten plants. Respiration. Respiration is the next step in the cycle, and unlike photosynthesis, it occurs in plants, animals, and even decomposers. Although we usually think only of breathing oxygen when we hear the word "respiration," it has a broader meaning that involves oxygen. To a biologist, respiration is the process in which oxygen is used to break down organic compounds into carbon dioxide (CO 2 ) and water (H 2 O). For an animal then, respiration is both taking in oxygen (and releasing carbon dioxide) and oxidizing its food (or burning it with oxygen) in order to release the energy the food contains. In both cases, carbon is returned to the atmosphere as carbon dioxide. Carbon atoms that started out as components of carbon dioxide molecules have passed through the body of living organisms and been returned to the atmosphere, ready to be recycled again. Decomposition. Decomposition is the largest source through which carbon is returned to the atmosphere as carbon dioxide. Decomposers are microorganisms that live mostly in the soil but also in water, and which feed on the rotting remains of plants and animals. It is their job to consume both waste products and dead matter, during which they also return carbon dioxide to the atmosphere by respiration. Decomposers not only play a key role in the carbon cycle, but also break down, remove, and recycle what might be called nature's garbage. Human-caused increase of carbon dioxide in the atmosphere. In recent history, humans have added to the carbon cycle by burning fossil fuels. Ever since the rapid growth of the Industrial Revolution in the nineteenth century when people first harnessed steam to power their engines, human beings have been burning carbon-containing fuels like coal and oil (called fossil fuels) for artificial power. This constant burning produces massive amounts of carbon dioxide, which are released into Earth's atmosphere. Over the last 150 years, the burning of coal, oil, and natural gas has released some 270 billion tons (245 billion metric tons) of carbon into the air in the form of carbon dioxide. Luckily, more than half of the carbon dioxide emitted by the burning of fossil fuels is absorbed by the oceans, by plants, and by soils. Regardless, scientists feel fossil fuel consumption could be an example of a human activity that affects and possibly alters the natural processes (photosynthesis, respiration, decomposition) that nature had previously kept in balance. Many scientists believe that carbon dioxide is a "greenhouse gas." This means that it traps heat and prevents it from escaping from Earth. As a result, this trapped gas leads to a global temperature rise, a natural phenomenon known as the greenhouse effect, which can have disastrous effects on Earth's environment. send me some information about carbon cycle, carbon trading, Kyoto protocol and the greenhouse effect. Just wanted to ley you know your diagram was easy to understant and great to study! thanks! Thanks for the info,can you provide me more info on how deforestation helps in carbon cycle. The image says a lot. you diagram was really really easy to understand. thanks for the help. my biology teacher will be really happy! Your article is very understandable and the facts that it contains are well detailed. The diagram is a major help as well. Thanks alot! This will come in handy for my biology project! omg! thank you people this info really helped me!!! !....ahhh thanks millions! lol...i needed this for my biome powerpoint projekt! Thank you very much, your information was helpful and very simple. what is fossilisation in the co2 cycle? i have photosynthesis, consumption, combustion, respiration and dissolving but i dont know what process they all belong too. You have a nice informational and thx you for provide us nice more knowledge. It is really a useful article and it demonstrates very clear. Happy the information is very helpful to me. I have many question in mind that i should later it conclude. i have a friend his uncle has been pass away since eight years but still the dead body remains intact with no sign of decomposition.can you please explain this to me . Thanks for the GREAT information. My presentation is going to be great because of this THANKS!! its great and its well understood.. This was VERY helpful and awesome information!!! Thnx! Although I do agree with Caitlyn, You really need a better background. what negative effects of enhancing greenhouse effect? This was very helpful infomation! thank you so much ! ! ! ! ! ! What other names can you call the Calvin cycle? Also, what else can you call the TCA cycle? Thank you for the information. It helps much for my assignment. "Decomposition is the largest source through which carbon is returned to the atmosphere as carbon dioxide." I just want to thank you for the info. You should earn a degree in biochemistry with the potential you have! Thanks for the info! Had to do a booklet on every cycle at school. P.s it is hard to do this. Thank you for helping me I had a test in next lesson . I'm interested in how fast the cycle is. For the average carbon atom in my body, how long ago was it in the air? And for the average carbon atom in a tree, how long ago was that atom in the air? Thanks for making this webpage because I was struggling on the carbon cycle and finally I have a website to help me. How long does a carbon atom stay in the leaf of a plant? This is very helpful for our project, thanks very muuch. cycle are very complicated and can take millions of years to make a full circle.